This entry was posted in Uncategorized on September 30, 2015 by Jamrip. It is my pleasure to announce new concerts this October in collaboration with Jonathan Priestley, Greg Rawson and Scott Marshall. 10th Oct. Guitar Recital with Jonathan Priestley. Oct 10th 2015, 7:30pm at Wirksworth United Reformed Church, Coldwell Street, Wirksworth. For this fundraising concert in aid of the Syrian Refugee Appeal I am teaming up with my good friend Jonathan Priestley an excellent classical guitarist and composer. We are preparing duos by Giuliani and Telemann was well as solos by Dowland, Bach, Albeniz and Sainz de la Maza. Tickets are £10 (£7 concessions). Oct 16th 2015, 7:30pm at The Chapel of St Mary on the Bridge, Sowter Rd, DE1 3AT. Tickets £8. 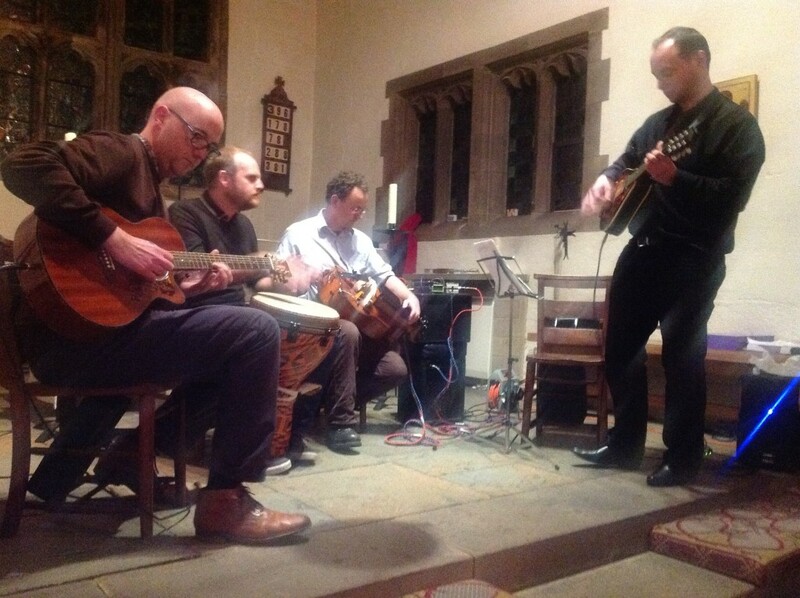 The Bridge Chapel Concert in Derby 2014 featuring Andy Gatford, Greg Rawson, Scott Marshall and James Rippingale. The Autumn Bridge Chapel Concert has become quite a tradition in Derby and is now now in its 5th year! Kindly organised by Soundbites of Derby the concert aims to create an eclectic mix of music from around the world and from many historical eras with an exciting mixture sounds from some of Derbyshires most unique instrumentalists. Proceeds always go to a good cause and this year we are raising funds for the homeless charity Crisis. Please click here for a link to the Crisis website. The first half will feature classical guitar solos and duets from James Rippingale and Jonathan Priestley including music by Telemann and Giuliani. The second half will feature Scott Marshall on Hurdy Gurdy and Greg Rawson on Djembe. It will be amplified, exciting and probably quite unpredictable with a mixture of Folk and Medieval musical offerings……. Please click here to view a video from last year. This entry was posted in Uncategorized on September 26, 2015 by Jamrip.